Rye Here Rye Now - a run down. Started by two graphic designers, Miho Aishima and Kat Garner, you might think that the Rye Here Rye Now community would be mostly designers, illustrators and arty-types but that’s not the case at all. It’s open to all creatives - professionals and part-timers alike - and covers numerous creative disciplines, from designers to writers, photographers to painters and more. Here I’ll give you some info about Rye Here Rye Now in words rather than pictures just to mix things up, because there’s much more to this little (but fast growing) networking group than meets the (r)-eye! Firstly, it’s not just any old networking group. I don’t want to outline the evening in too much detail because if you’ve never been before it’s nice to experience it without lots of prior explanation. However if the word ‘networking’ makes you run a mile - and let’s face it a lot of creative types are way more comfortable in their studio or office than talking to a room full of strangers - at RHRN you don’t need to worry. Kat and Miho have a few tricks up their sleeve which makes any kind of ‘networking’ e-a-s-y. As with most functions you’ll be asked to write a name tag when you first arrive, and you’ll also be asked to put some coloured dots on it. This isn’t just for decoration (although it does that too, at RHRN we love a bit of colour so it’s win win!) In fact each colour represents a creative industry - design, animation, photography, etc – and you put the coloured dot on your name tag that best represents your discipline. Got a green dot on your name tag? Look around - immediately you can find other people creating in the same area as you. Perhaps you’ve come along looking for someone in a different field that you’d like to hire or collaborate with. Need photography for your website, a logo or some copywriting done? Or maybe you just want to chat with others who freelance in the same field you do, as it can be tough working at home alone. The colour coded stickers mean you can easily work out who might be able to help. Some people have one coloured dot on their name tag, others have five. There is so much you can get out of this simple system but at the bare minimum it provides interesting and super easy talking points to help you get started. There’s no need to worry if what you do is right for RHRN, if you’re a little bit creative, a little bit local then come along, there’s a coloured dot for you. And no need to worry about walking in to a room full of strangers - chances are they’ll be strangers for five minutes max. If you’ve been to RHRN before, share with us how you found the dot system - did it work for you? Did it help you meet new people? 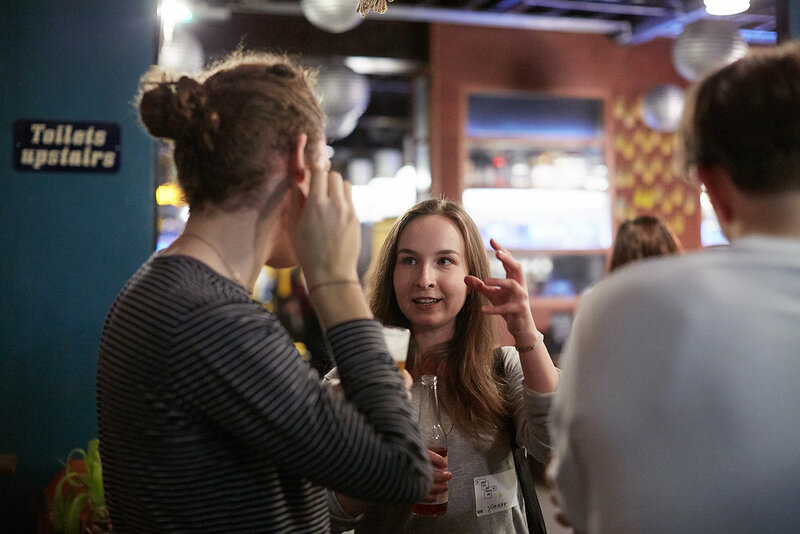 Next time we’ll be talking about the discussion-starter questions, because boy oh boy have I learnt some seriously interesting stuff with this little networking trick! We hope to see you and your coloured dots at the next event!